A few weeks ago, one of my best friends got married. The wedding was amazing, she was beautiful, and we celebrated into the wee hours of the night. This was the rehearsal dinner dress that I stumbled upon at Nordstrom Rack. The classic shape & bold color makes it easy to wear to any event. 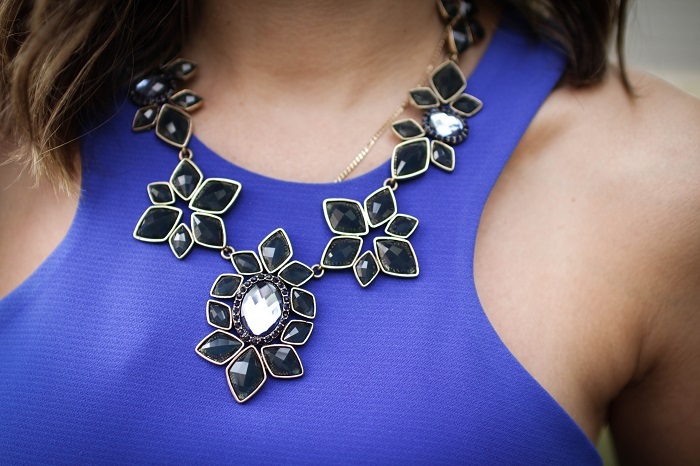 The Happiness Boutique sent me this great statement necklace that really complimented the royal blue in the dress. Loving the dress AND the statement necklace! They work perfectly together, too. Whatta babe! You look so cute! You are totally rocking this body hugging blue number. Love the red shoes with it.